Obama says U.S. is looking for signal of "changes in how Cuba operates"
(CNN) -- The Cuban government, long the object of a U.S. economic blockade, is prepared to meet with the Obama administration, Cuba's leader said. "We've told the North American government, in private and in public, that we are prepared, wherever they want, to discuss everything -- human rights, freedom of the press, political prisoners -- everything, everything, everything that they want to discuss," Cuban President Raúl Castro said Thursday at a summit of leftist Latin American leaders in Venezuela. The response came days after President Obama lifted all restrictions on the ability of American citizens to visit relatives in Cuba as well as to send them remittances. Travel restrictions for Americans of non-Cuban descent will remain in place. This week's move represents a significant shift in a U.S. policy that had remained largely unchanged for nearly half a century. The U.S. government instituted the embargo three years after Fidel Castro came to power in 1959. In Mexico City for meetings with Mexican President Felipe Calderon, Obama offered a carrot and a stick to Havana. 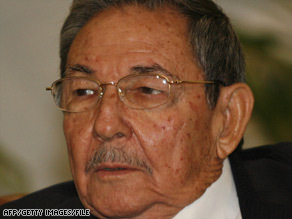 "What we're looking for is some signal that there are going to be changes in how Cuba operates that assures that political prisoners are released, that people can speak their minds freely, that they can travel, that they can write and attend church and do the things that people throughout the hemisphere can do and take for granted," he said. "And if there is some sense of movement on those fronts in Cuba, then I think we can see a further thawing of relations and further changes."